Ducati takes the world of Supersport road bikes to a completely new level by presenting the 1299 Superleggera, the first standard street bike with carbon fibre frame, swinging arm, subframe and wheels. 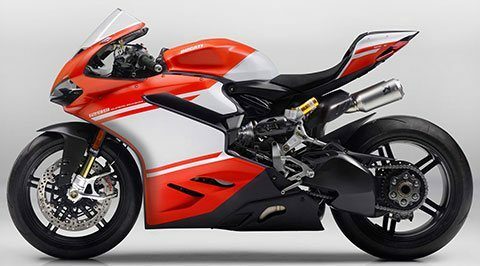 The 1299 Superleggera is the greatest expression of engineering, technology and performance ever put into mass production by a motorcycle manufacturer. The quintessence of Ducati is exclusive in everything, even in the limited number of these motorcycles produced: only 500, for a lucky few Ducatistas. The fairing, also made of carbon fibre, is just the tip of the iceberg of a unique project that only a brand like Ducati with racing in its DNA could accomplish. In fact, under the fairing hides the most powerful version of the Superquadro. 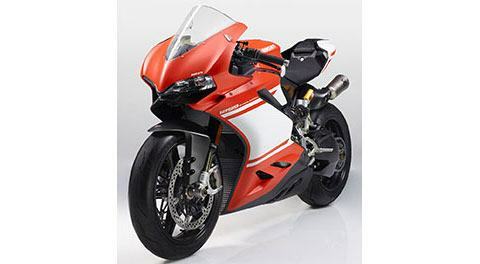 With its 215 horsepower*, the Desmodromic EURO 4 engine on the 1299 Superleggera is the most powerful twin-cylinder ever produced, representing the best of Ducati technology. 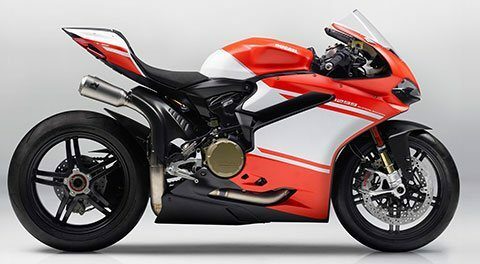 The exclusivity of the 1299 Superleggera is underlined by the new electronic package that uses an inertial platform system with six axes (6D IMU - Inertial Measurement Unit) to manage the electronic controls that on this bike rise to a level of primacy. This system has made it possible to further develop the Ducati Traction Control EVO (DTC EVO) presented on the 1299 Panigale S Anniversario thanks to the introduction of the Ducati Slide Control (DSC) which ensures even better performance when exiting corners. 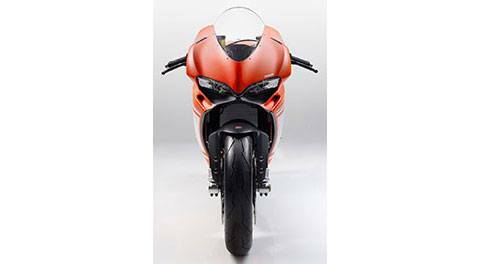 FRONT / REAR WHEELS: Never before have carbon fiber wheels been featured on a street-legal production motorcycle. High-strength carbon fiber is employed, matched to aluminium wheel hubs fastened to the carbon fiber structure, for maximum resistance over time. The carbon fiber wheels undergo severe testing processes that guarantee the capability of withstanding the high stresses that wheels are subjected to on an extremely high performance motorcycle such as Project 1408. Every single carbon fiber wheel undergoes the most advanced inspection techniques in order to guarantee maximum reliability and performance. These tests are the same as those used for the carbon fiber frame and swingarm, and include Active Transient Thermography, Ultrasonic Phased Array and Computed Axial Tomography. The carbon fiber wheels on Project 1408 reduce unsprung mass and lower the moment of inertia, resulting in greatly improved handling and quicker response. The overall weight reduction of 1.4 kg (3.1 lb) for the pair of wheels compared to forged aluminium rims, guarantees a reduction in rolling inertia of 26% on the front and 58% on the rear. SWINGARM: The carbon fiber swingarm debuts in a series production motorcycle, underlining the pursuit of lightness and maximum performance, elevating Project 1408 to the pinnacle of sport bike engineering and technology. Ducati R&D, collaborated closely with Ducati Corse concerning calculation methods, choice of materials and final testing procedures, in order to guarantee maximum integrity in all operating conditions. In order to ensure maximum quality and consistent performance, each and every carbon fiber swingarm produced undergoes stringent inspection procedures such as Active Transient Thermography, Ultrasonic Phased Array and Computed Axial Tomography. These techniques are generally used in Aerospace and in applications that require the utmost precision and quality. 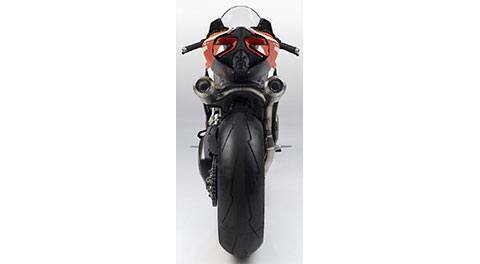 The swingarm employs the same technology as the monocoque frame: high-strength carbon fiber and a high-temperature-resistant resin system with 7075 aluminium alloy inserts, co-laminated in the carbon fiber structure. The high-tech materials and production processes guarantee a weight saving of 900 g (1.98 lb), or 18% less than the aluminium swingarm of the 1299 Panigale. FRAME: For the first time in a series production motorcycle, Project 1408 features a carbon fiber frame that has been designed by Ducati R&D using Ducati Corse know-how in terms of production processes and stress testing. In the development process, all carbon fiber parts endure severe testing procedures that guarantee integrity in all operating conditions. Every single carefully crafted carbon fiber monocoque frame undergoes MotoGP-standard quality control measures such as Active Transient Thermography, Ultrasonic Phased Array and Computed Axial Tomography. The monocoque frame is made of high-strength carbon fiber and a high-temperature-resistant resin system with 7075 aluminium alloy inserts, co-laminated in the carbon fiber structure. Overall weight saving compared to the frame of the 1299 Panigale is 1.6 kg (3.53 lb), or 38% less than the aluminium monocoque frame. CRANKCASE: Racing-derived production processes are used extensively in the Superquadro engine, such as for the sand-cast crankcase, a production method normally reserved for the highest level of competition engines. CYLINDER HEADS: In order to optimise air flow and increase peak performance, the cylinder heads feature redesigned ducts, large diameter titanium valves and higher lift camshafts compared to the standard 1299 Superquadro engine. PISTON AND CONROD: The new titanium conrods and new 2-segment, 116 mm diameter pistons with optimised combustion chamber design, offer optimal performance and a compression ratio of 13.0:1. ALUMINIUM CYLINDER LINERS: Aluminium cylinder liners are fitted in order to achieve maximum performance matched to the lowest possible weight. FRONT FORK: Exceptional handling and stability are guaranteed by a racing-derived, fully adjustable 43 mm Öhlins FL 936 fork with TiN treatment, lightweight billet fork bottoms and lightweight stress-optimized outer tubes. In the quest for maximum lightness, lightweight springs are also used. SUBFRAME: Carbon fiber is also employed for the subframe of Project 1408 and is designed with the sole purpose of reducing overall weight while maintaining optimal mechanical performance. The latest NDI techniques were used during the development phase, and matched to the highest quality carbon fiber and resins, guarantee exceptional performance over time. 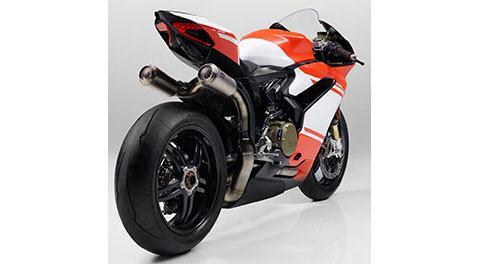 The advanced production process matched to the lightweight carbon fiber results in a weight saving of 1.3 kg (2.87 lb) compared to the aluminium subframe of the 1299 Panigale. TITANIUM SCREWS: Manufactured to the highest standards, titanium screws are used extensively on Project 1408 in order to guarantee maximum weight saving and optimal quality. ALUMINIUM GAS TANK: The lightweight aluminium gas tank is precisely shaped to ensure optimal contact points with the rider’s legs, allowing for maximum control in all riding conditions. High quality craftsmanship, matched to the finest materials, guarantee weight saving down to the smallest detail. REAR SHOCK: At the rear, wheel movement is kept precisely in check by a fully adjustable Öhlins TTX36 shock with a lightweight titanium spring, that is connected via an adjustable linkage to the carbon fiber single-sided swingarm. Front - 10-spoke carbon fiber 3.5 x 17 in. Rear - 10 spokes carbon fiber 6 x 17 in.